23 women receive life-changing goitre operations in Lwanza, Katanga Province. ​Dr Graham Fry (Ireland) and Dr Serge Yumba (DRC) trained 4 other Congolese doctors in the procedure, thus multiplying their skills. Most Kiwis take their healthcare system for granted. Many complain about its inadequacies and wonder why we can't spend whatever it takes to save lives. These are first-world concerns. 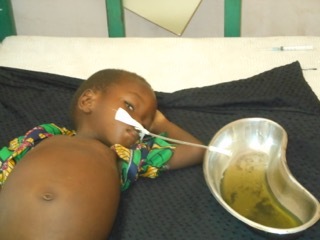 In DRC medical problems are more basic, and the cost of saving lives is minimal. So we have an ethical dilemma: Is it right to spend $100,000+ a year to save a single life in New Zealand while that same money could save thousands in Africa? We are not talking about starvation, we are talking about people who will die simply because they do not have access to basic medicines and simple surgical procedures. Ultimately this is true. Africa's problems need to be addressed by Africans. The wider political issues that cause much of the suffering in Africa are long term realities that must be addressed by those who can bring about change from within. On the humanitarian front, however, a case can be made for strategic assistence from the West in partnership with honest, skilled and compassionate medical staff inside Africa. Cedric, a young boy suffering from Typhoid, receives life-saving surgery at Luanza hospital. Advanced typhoid often perforates the intestines, releasing the contents of the stomach into the abdominal cavity. Cedric's abdominal cavity has been drained and the perforation repaired. Note the use of surgical gloves for fluid drainage! Simple things are often the best in DRC. Where large multinational agencies often fail is in integrating well-intentioned help with local knowledge and strategic people within the local population. The most effective assistance is a partnership between donors and locals on the ground — proven, trustworthy skilled individuals who will get the job done. We have established friendships with people like Dr Serge Yumba who heads up the medical coordination of 10 hospitals in the Katanga province, DRC. Dr Serge has an excellent reputation locally and is now also working closely with Operation Smile, a US based surgical NGO. Operation Smile have teamed up with Dr Serge to complete numerous fistula surgeries in 2015-16 and are in the process of setting up further joint projects in DRC for 2017. The great thing about working in the Congo is the fact that most hospitals we are dealing with are run by very competent national staff. Mission Garenganze has a training hospital in Mulongo, some 450km north of Lubumbashi (the main city in Katanga Province). Serving over 50,000 people, Mulongo hospital has several surgical interns being trained at any one time. The need for more well-trained surgeons is high, so there are plans underway to make Lwanza into a training hospital as well. Dr Serge (far left) visits with fellow medical staff at Lwanza. He is working with Dr Jean-Claude (2nd from the right) and his wife Nadege (not pictured) in order to expand Luanza's surgical training facilities.